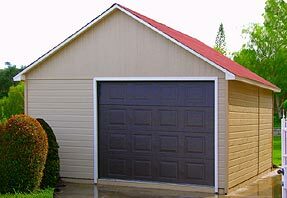 This 16 x 20 Garage Kit features a gable roof and Sand low-maintenance siding. The 8' garage door is set to one side to allow room in the interior for a work bench and tools. The back of the structure features two cedar crank-opening bar windows and a standard cedar door, both of which have been finished in white with an opaque stain. Click on the pictures in the filmstrip to view larger images of the garage kit pictures shown there. Use the models listed in the design center as a starting point for your garage kit design. Use this design center to price and/or customize this garage kit design. Use the different sizes shown below as a starting point. Watch our design center instructional video and find out how to design and get pricing for this garage kit style in almost any size!